The Brides Choice Awards recognises Wedding Businesses that operate in Regional Areas of Australia. They can be Nano Businesses, Micro Businesses, Small Businesses or even Major Corporates. Launched in 2011, the Brides Choice Awards acknowledges those wedding businesses that have excelled and exceeded the expectations of their Brides from around Regional Australia. 2018 marked the launch of the inaugural Western Sydney Region Brides Choice Awards. Winners of this award are voted on by the brides themselves, so no outside judging, simply it represents a reflection of each nominee in the eyes of brides. The awards recognise excellent quality of service, professionalism and flexibility of wedding suppliers and are accordingly voted on by the brides themselves and their experiences in planning their special day. In my case, I knew nothing about this and wasn’t even aware that DJ:Plus! 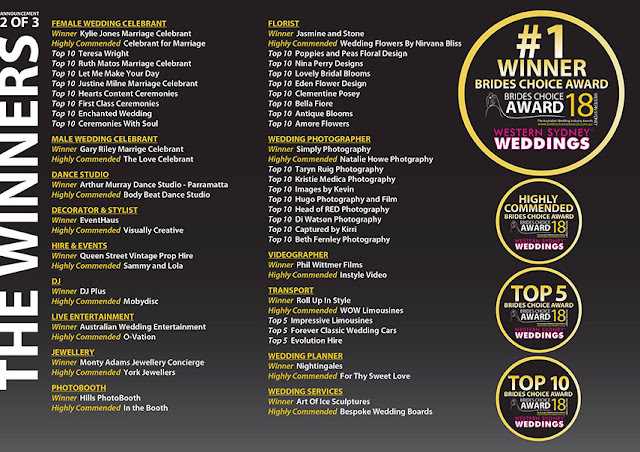 Entertainment had been nominated until tagged on a Facebook post by Brides Choice Awards announcing the Winners! Each wedding that DJ:Plus! Entertainment is given the privilege of entertaining at is extremely special. Each wedding is unique and each wedding deserves the same love, care and attention as the one before it to make it as perfect as it can be for every couple. Thank you to all the wonderful brides that took part in this process, have ever invested their trust in me and voted for DJ:Plus! Entertainment, your approval of what I do is very much appreciated and valued – it truly fills my heart with much love and happiness. Thank you! Thank you!